The famous Jolly Green Giant is scheduled to make an augmented-reality appearance at New York City’s Grand Central Terminal from 11:00 a.m. to 6:00 p.m. today to promote the vegetable brand’s “One Giant Pledge” marketing campaign. This unique digital marketing initiative encourages families to pledge to eat an additional vegetable each day over the next month. MediaPost.com covered the details of this virtual veggie promotion. Today’s event allows attendees to take the pledge and actually interact with the famous mascot via augmented reality. Alison Sweeney from “The Biggest Loser” is also appearing to take the pledge and discuss how the General Mills brand can make it easier to reach the vegetable goal. The vegetable spectacle is also featuring live entertainment, along with healthy eating tips and recipes for busy families from child nutritionist Melissa Halas-Liang. Launched with a TV commercial last week, the campaign designates the popular Green Giant character as a family’s ally in increasing their daily vegetable consumption in a fun-loving way in order to be at their best. The Green Giant Facebook page serves as the center of the digital marketing campaign, where each member of the family can personalize their pledge and post a photo that can be printed, shared, and added to a special Facebook photo gallery. The first 10,000 children to take part in the pledge can get a One Giant Pledge wristband. Random pledges are being transformed into “veggie art” to be featured on the Facebook page. 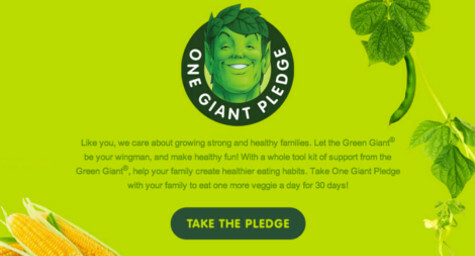 In addition, the page offers a digital tool for creating customized postcards of children interacting with the Green Giant, along with a 30-day pledge calendar for monitoring meal progress, a downloadable ringtone of the character’s famous “ho, ho, ho” phrase, and much more to help families meet their veggie goals. To learn more about incorporating Facebook advertising into your company’s digital marketing efforts, contact MDG Advertising today at 561-338-7797 or visit mdgadvertising.com. MDG Advertising, a full-service Florida advertising firm with offices in Boca Raton and New York, NY, specializes in developing targeted Internet marketing solutions, exceptional creative executions and solid branding and media buying strategies that give clients a competitive advantage. Our core capabilities include branding, logo design, creative, digital marketing, print advertising, media planning and buying, TV and radio, public relations, website design and development, email marketing, social media marketing and SEO.